The Hotel Splendid , 2-star hotel in Gabicce Mare, is a family-run property located near the beach, with parking, WI-FI and services for children. Admits small pets. The hotel is located in Gabicce Mare in the central area: it overlooks the beach on one side and on the other the main square of the town. The rooms have a balcony with sea view, air conditioning, WI-FI, satellite TV, telephone, safe, minibar, private bathroom with shower and hairdryer. 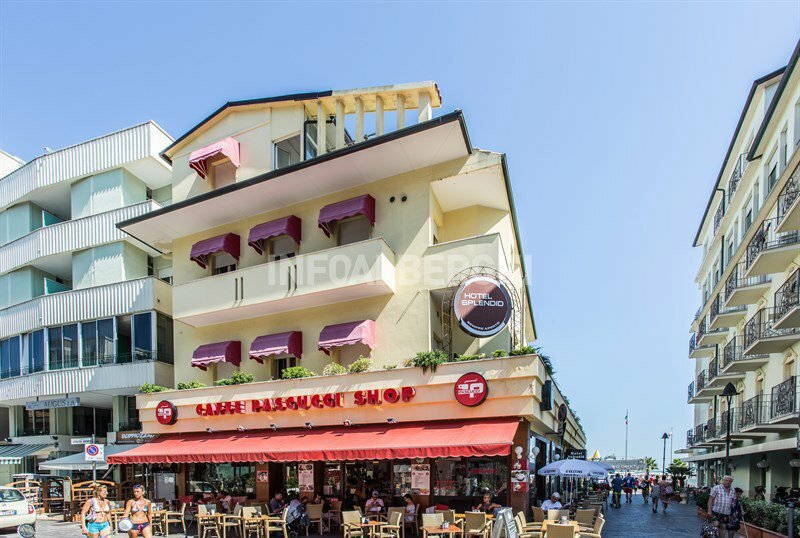 Terrace, free bicycles, TV room, air-conditioned restaurant, bar, lift, reading room, theme nights, beach towel available for free, free shuttle service to the parking lot and the station of Cattolica and Gabicce. PARKING: covered, for a fee (free in the all-inclusive formula). CONVENTIONS: amusement parks, beach, shuttle service for parking and railway station. LUNCH AND DINNER: the kitchen offers menus with 6 choices of first and 3 second courses, fish and meat always present, buffet of side dishes and appetizers. Water with meals is always included, while wine and drinks are included in the all-inclusive formula. Pasta and desserts are homemade. In the room: cots, side rails. At meals: high chairs, baby menu agreed with mothers, baby food, flexible hours. On the beach: swimming pool for children, baby / mini / junior club, live entertainment. The hotel has an agreement with the equipped facilities n. 10-12-14-16. Guests can enjoy a large 120 cm deep pool surrounded by sun loungers. Also available: hot showers, sunbeds, beach umbrella, gym with fitness area, equipped nursery, playground area, ping-pong tables and beach volleyball courts, soccer and bowls.